Slot car racing is a miniature racing game with powered vehicles operated by the user with hand held controllers. The cars are guided by grooves/slots around a designed track layout. Slot car racing a great social hobby and with something for everyone. From casual home users, competitive club racing, model builders and collectors. Scalextric is of course the brand that most people recognise, but it is a testament to the resurgence in popularity in the hobby that there are so many quality slot car products available now from many different manufacturers around the world. Slot cars are available in various sizes. Generally the most popular scale produced is 1/32nd. The majority of the cars that you will find at Pendle Slot Racing are 1/32 scale. We also supply the big 1/24 scale cars and the compact 1/43 scale models. If you are new to the slot racing hobby and want to get started, then buying a set is the most cost effective and easiest way to go racing. The Sets contain everything you need in one box, track pieces, controllers, power supply and usually cars with the possibility to add more track pieces and accessories if required. It could also join the many racing clubs around the UK and world. Slot car racing is all about running as close to your car's limit as you possibly can, for as long as you possibly can, without actually going over that limit and falling off. The most important points to emphasise are smoothness, consistency and staying on! There is absolutely no point in being super-quick, but only being able to stay in the slot for a couple of laps at a time. When a car is going into a corner, the ideal is for the car to still be braking so that the weight transfer presses the guide down into the slot and stops the car de-slotting. If you brake too early the car will slow down too soon and actually have to apply power to enter the corner. When applying the power again, the weight transfers to the rear, making the front of the car go light - so it can more easily de-slot. Alternatively, if you brake too late and going too fast into the corner, at best the rear end will swing round or the car will fall off. Just as it is important to start braking at the right time, it is also important to stop braking at the right time. By coming off the brakes at just the right time and applying the power again you can carry the speed through the corner. If the car has too much grip, it can dig-in and tip out of the slot without warning, so it has to be driven below its limit just to make sure it doesn't fall out. If the car slides too much, so that the rear is noticeably sideways or even fish-tailing, the power cannot be put down effectively - the car will be slow down the next straight. What is in a Slot Car? 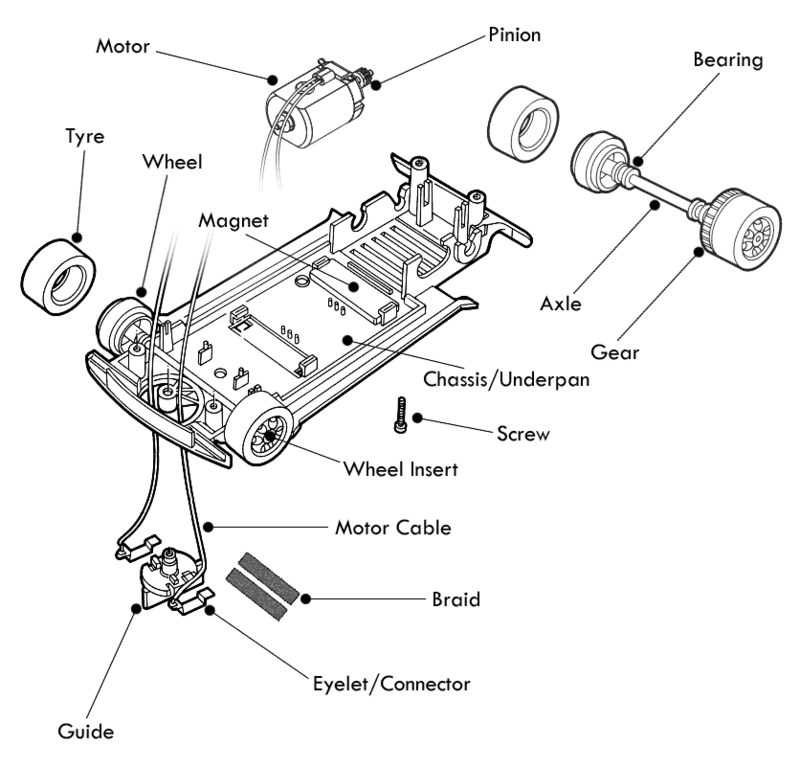 Below is a basic diagram showing the general overview of the parts in a Scalextric and other models. Most cars come fitted with magnets, this simply aids cornering grip around your circuit. Magnets are great for beginners as it gives your car a better chance of staying on the the track. It's all about choice whether you race with magnets or remove them. We prefer to race cars without magnets as it it a bit more challenging in terms of car-setup and racing. Cars fitted with magnets do hide and smooth out all the cars raw performance handling issues.